Around February, I start looking for any sign of spring. Like most gardeners, I visually measure growth of snowdrop and crocus leaves, waiting for the first true flowers. But there is a qualitative difference between seeing “spring” in a tiny spot in my garden and seeing spring start to sweep the landscape. The first real rush of spring, to me, is when I start noticing a golden cloud in the woods – willows. 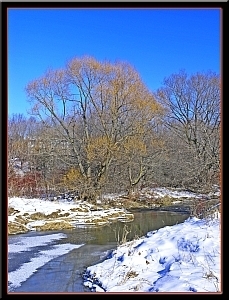 There are many willows with colorful bark, even all winter. But the most prominent of those are shrubs. I look for the trees, especially groves of trees where the young branches grow yellow in the spring, and I usually see them by the end of February. This year the turning point was the very first week of February, when I saw a golden haze across an empty farm field – backlit willows! It is relatively easy to spot the introduced “weeping willow” (Salix x sepulcralis and S. x pendulina) with its distinctive silhouette of pendulous branches. But there are many other willows with yellowish branches, some native in the Finger Lakes, many introduced. I am not even close to an expert on willows, and there are so many species and cultivars that it would be folly for me to try to conclusively identify which species I see. But with a fast tutorial from David Werier and some internet searching, I have some guesses. Probably the large patches of yellow branches are from Salix x rubens, the naturalized hybrid of S. alba and S. fragilis, both Eurasian species and both listed as occurring here themselves. According to David, experts think that most reports of pure Salix fragilis in North America are really the hybrid S. x rubens, as the distinction can be difficult. This hybrid definitely forms colonies and can have either erect or drooping branches. I might also be seeing S. alba and S. amygdaloides when I spot a sprinkling of yellow from individual trees. Just for fun, I searched the most current Salix key (ref 1) for trees found in New York with yellowish branches or branchlets. The following table gives my results, with notes on local status (ref 4 & 5). frequent (Although according to ref 3, in New York this name is misapplied to either S. x sepulcralis or S. x pendulina). Other possibilities that did not fall out of the search include Salix alba itself (yellowish, erect, common (ref 4)), and conceivably S. nigra (native, yellow-brown, erect branches, less common than it used to be around here). The differences in local occurrences between species and hybrids are indicative of ongoing discussions among taxonomists, beyond the scope of this essay. Let’s just say that there are several possible options for my “golden branches”. • And, of course, once they appear, catkins & leaves. • The Flora of North America treatment of Salix is due out soon, but the key is already available online via the FNA website (ref 2). 1. George Argus key from (Salix of North America 5/7/2003).